This is great and thanks for allowing me enjoy with you. I think your wife will be more confident if she sat down. Standing is not always the answer. Very nice. Nice pics, nice report. Some seriously dramatic scenery there! The next day I talk to a couple of people about DÂ´s bike, and find out that itÂ´s not the water pump, but just an air lock that is probably causing it to overheat. We will see. The rest of the day is spent visiting a gold mine on the Amazon side of the Andes. I am too tired to do this trip by bike, although it would be an awesome trip in itself. I guess itÂ´ll have to wait. Friday arrives and we leave early in order to have time to work on the other bike. 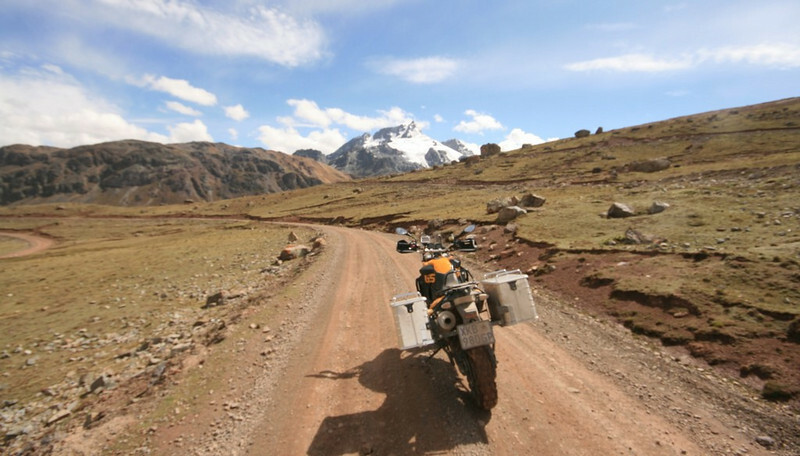 I travel the fastest route possible back to DÂ´s bike, which means cruising along the highway to La Oroya, and then from there up to Ticlio, the top of the pass over to Lima and the site of the highest railway line in the world at 4,818m above sea level. 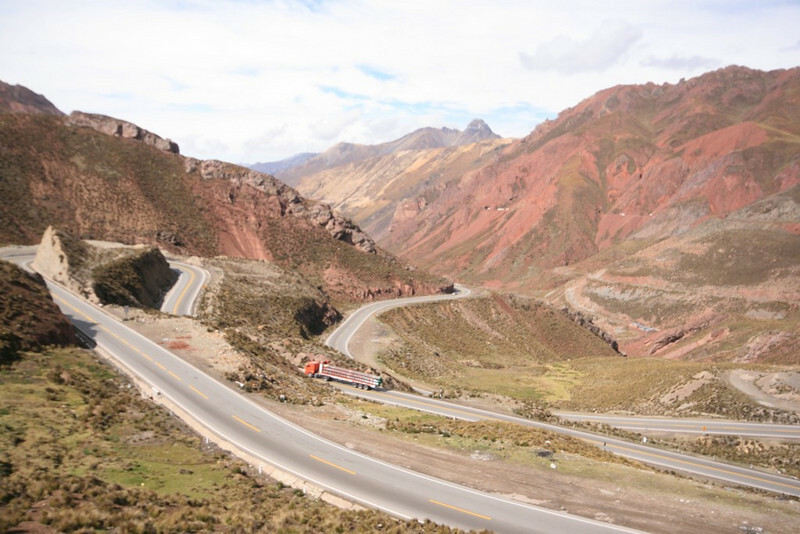 We stop in La Oroya to pick up C-clips and antifreeze before proceeding through a picturesque area. The route to Ticlio is impressive indeed. 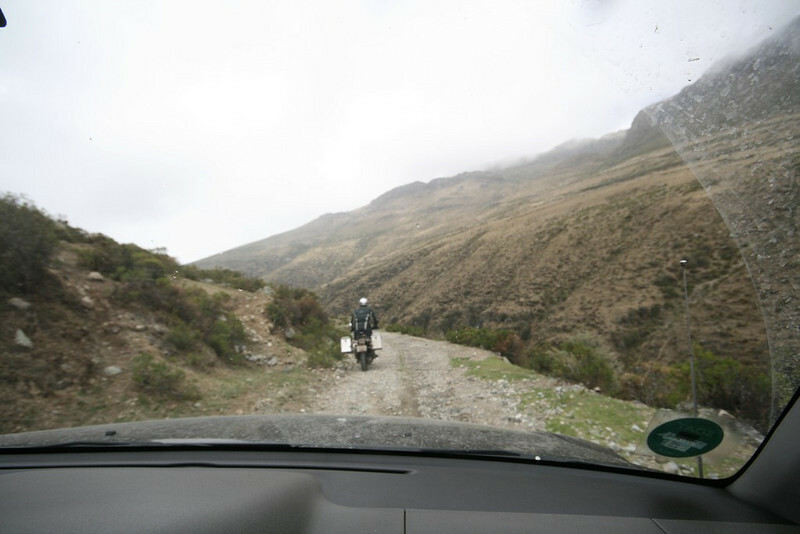 The other side of the pass consists of a fantastic set of twisties that eat up my TKC 80Â´s as I do my best to scrape the mud off my pannier boxes on the bends while dodging 18-wheelers grinding their way wearily over the mountains. 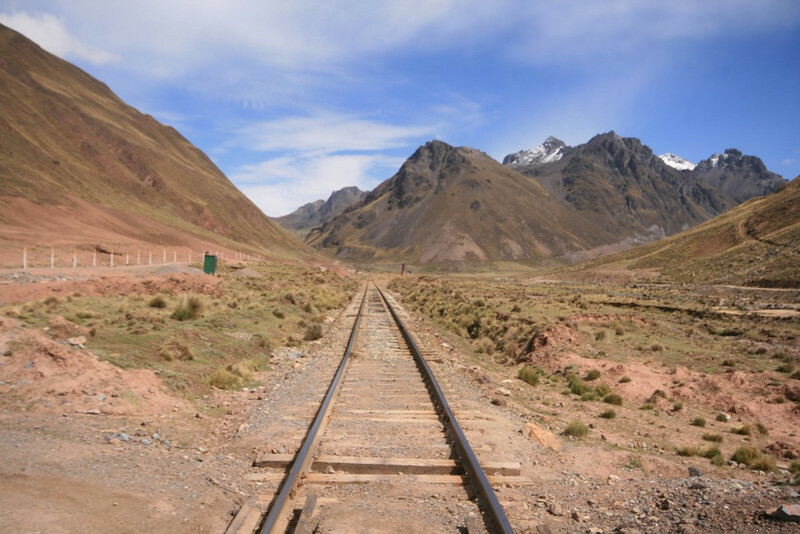 Back down at 4,000m I turn off onto a dirt track that crosses the railway line. with rough â? ?short cutsâ?� cutting out many of the long, winding meanders. I have moments of sheer delight pushing the bike up steep slopes between the cutbacks. A little too rough for photos though, sorry. and I negotiate a series of slippery short cuts with difficulty, almost greeting the salt of the earth a couple of times, before I cut back onto the pass that we came up on. Its energetic stuff and itâ? ?s a battle sucking oxygen up here. My wrists are shot and itâ? ?s a battle to squeeze that front brake. Standing up on my pegs has numbed my feet, and my legs feel the fatigue of bent knees the whole time. 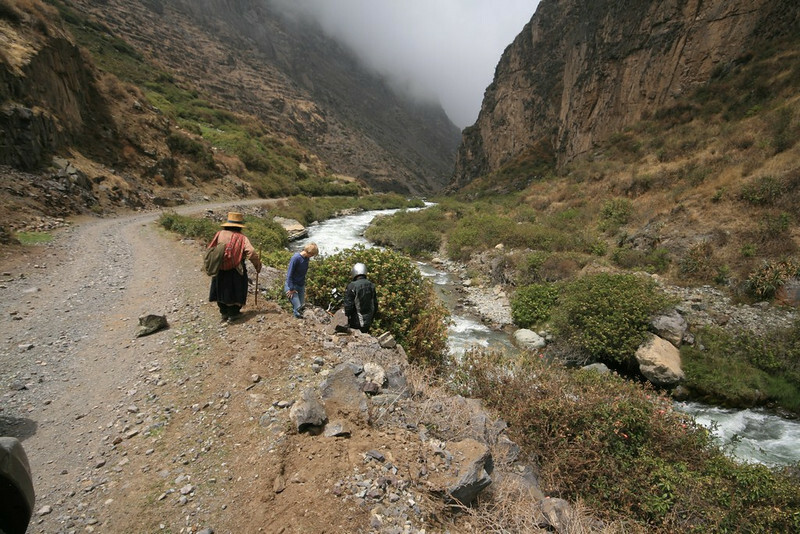 Yet itÂ´s vital to stand in this terrain, I would be paddling the whole time if I wasnÂ´t, and with hard panniers on, the risk of getting a leg or ankle caught and broken under one of them in a fall is simply not worth it. I put in an hour of hard riding, followed by 10 minute breaks. I start getting into descent mode. Leaning into the corners and dodging rocks becomes a rhythm of flowing movement, quite pleasant and disarming in its simplicity. 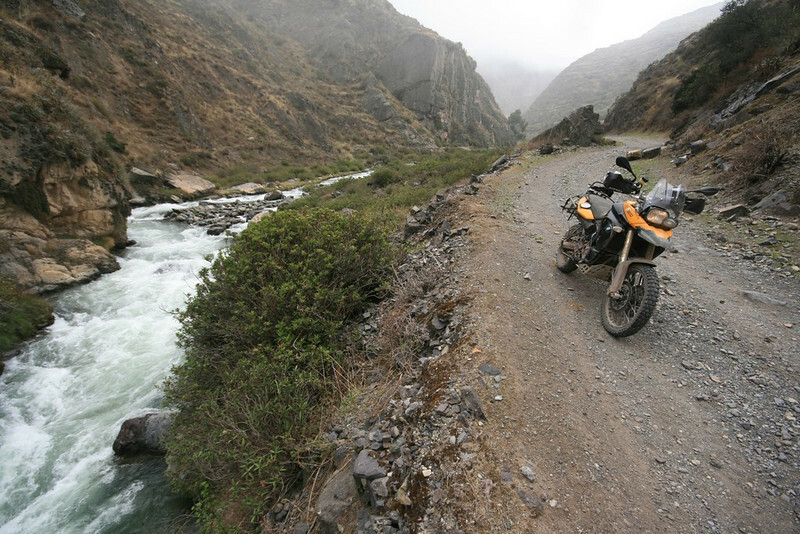 I come around yet another left hand bend and move over to the right to get past a big rock in the road, whilst glancing down at the raging, frothing river some 10 m below. 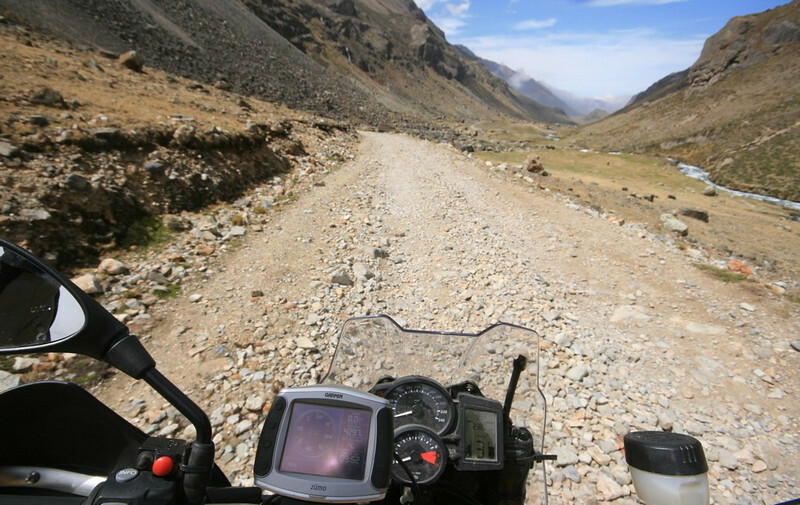 As I swish past the rock, leaning over to the left to swing the bike away from the edge, I suddenly feel the back wheel violently flick out to the right. If I hadnÂ´t been leaning over, I would have been flung into the air for sure. But somehow IÂ´m still on the bike, my weight on the â? ?low sideâ?�, sliding sideways. Amazingly enough I find it snugly nestled in the arms of a bush, clinging to the near vertical slope. I slump back onto the road nursing my left knee and hand, generally feeling pretty horrible. Julio arrives on the scene with D, who are greeted with the sight of a number plate and pannier box lying on the road, and me perched on the edge with no sign of a bike. D, loving wife that she is, rushes over to me without sparing a thought for the machine. I ask for painkillers, get handed some, and promptly forget to drink them, but it turns out that nothing is broken. Three cheers for ATTGAT: Hip-hip hooray! 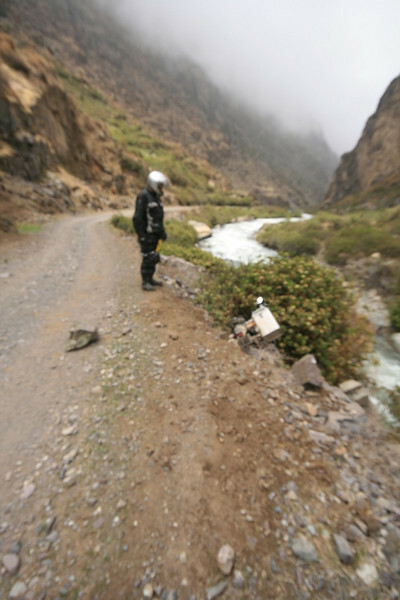 IÂ´m a little shaken and it takes a while for me to realise that one of my panniers is lying some 10-15m up the road. It truly is a miracle neither I nor my bike ended up in the river, that I am hardly hurt. I could have quite easily disappeared from sight and possibly drowned in the river before anyone were the wiser. D detaches the other pannier box from the bike. From this angle it doesnâ? ?t look too bad, but the bike is perched right on the edge of a vertical drop into the water. It takes us some time to work out what happened. I was convinced I was in full control of the bike when it suddenly twisted out of control. I was not power sliding around the corner, just taking it easy into the bend at around 60-70km/hr when suddenly the bike twisted out from under me. The only explanation I have can come to arises from this rock on the left. It must have connected with the left pannier as I leaned the bike through the corner, a good 10-15m further back up the road. Amazingly the pannier box is hardly damaged after the tumble, and I donâ? ?t really see any marks on the box. This I find confusing. I get down next to the bike and attach some tie-downs to it in an effort to retrieve the bike. Amazingly, a farmer is nearby and another horseman appear to help us pull the bike back up onto the road. Can anyone suggest another basic cause for this accident? Perhaps the pannier box fell off? I have had the panniers frames bent from a previous fall, but would a sudden release of 15kg on the one side of the bike have this much of an effect? I canÂ´t believe it. A view the other way of the scene for the specialists out there. I lost control about 20m behind the position of the bike. Equally amazing is all that is damaged in the bike is the clip on the cover of the left indicator and the big-foot side-stand extension was ripped completely off in the impact. I have a big gash in the fairing over the radiator but the crash bars have held up amazingly well. The radiator is fine. Everything else is fine. About twenty minutes later we set off and shortly arrive at the stranded 650, armed with the knowledge of our friends at Bavaria BMW in Pretoria. It doesnâ? ?t take long to bleed the cooling system and check it. Everything is fine. But after this incident we concur prudence is the order of the day, especially considering it is raining and the bike will be stored here until Sunday. I ride most of the way back in a soft, wet drizzle which makes for a hair-raising, photo-less trip in very poor visibility. Its hard going, and my nerves are shreds, nevertheless we get back without further incident. The time on the road was 8 hours for 300km. Attached are maps of the routes. 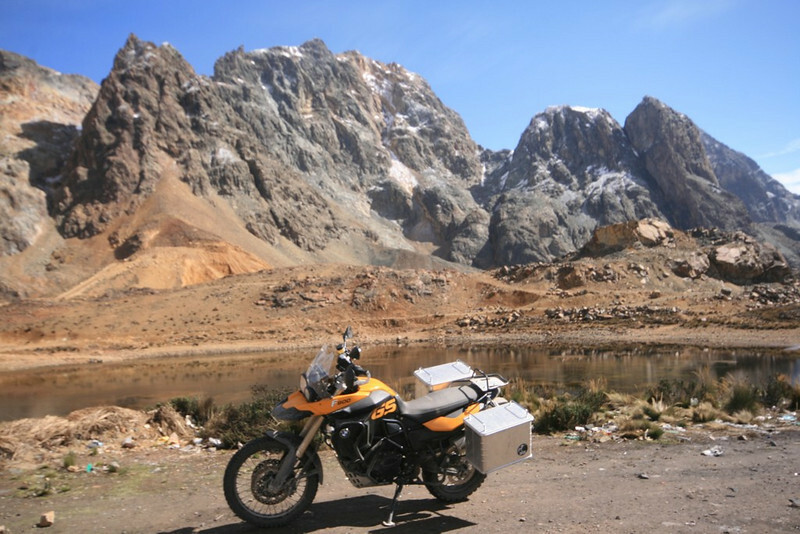 On Sunday we took the two hour drive up to DÂ´s bike and brought it down in perfect weather without incident. Undoubtedly this was a dramatic trip for us, one which I am still recovering from. 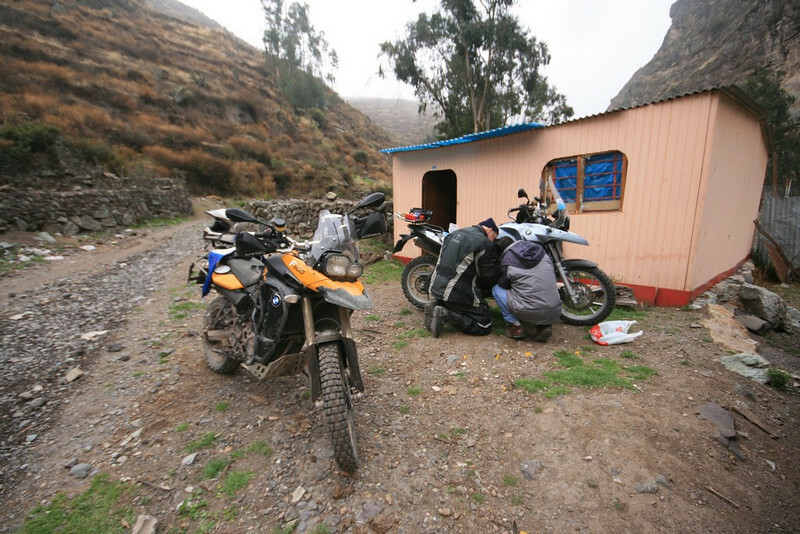 Nevertheless it was a great preparation trip for our ride up to Ecuador in early December. Very glad to hear you are Ok, but what a freak experiance. Is there any marks underneath the panier? Anymarks on the side wall of the tyre? It certainly sounds like you hit that rock, or maybe a smaller rock next to it, that threw your rear tyre. What a ride man !!! Well glad to hear you are OK and no great damage. No obvious marks on the pannier, IÂ´ll check under it. Finally going to clean the bike later today. I still think it was that big rock in the 1st crash pic that threw me, but I know I did not aim for it, I aimed to go past it on the right (of course it moved to that position in the photee with the bike). Hmm is there anyone else with this problem?? How do I fix this? Hi BB - I seem to have the same problem? Not sure how one fix this? Ok its fixed! I made the pics a bit smaller so that Beemerman can see them now. Do you want to see pics this size or bigger in future?? Recommended size for all types of connections would be best, not sure what that is though. Yip me too, first page ...no pics. BB your reports just get better and better. oh and BTW there are a lot easier ways to wash the bike than throwing it in the river. Thanks again for sharing, your reports are addictive. It's still SO weird to see the GP plates in surroundings like that, my brain still has not come around that one. Stunning pics, REALLY enjoying this! Ok I fixed up the first page AGAIN. Just dont use photobucket, they want to charge you and give you no warning before they shut you down. Smugmug works much better, clearly.